Hikers, mountaineers and trekkers are often exposed to challenging weather conditions and thus need high-performance clothing. 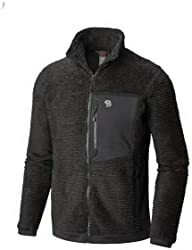 A high-quality fleece jacket is a very useful garment because it provides insulation and can be worn either as an outer layer (in dry weather) or as a mid-layer under a shell layer (in rainy weather). Fleece jackets are very comfortable, quick-drying, moisture-wicking and breathable. Due to these qualities, they are perfect for wearing directly over a base layer. They also provide good warmth even if they get exposed to moisture (high humidity, rain etc.) and are less expensive than other insulated garments such as woolen sweaters, down jackets or jackets with synthetic insulation. However, down jackets and jackets with synthetic insulation have a better warmth-to-weight ratio and compressibility (they can be packed very small) than hiking fleece jackets. Therefore, in very cold weather down jackets and jackets with synthetic fill are preferred, while fleece jackets offer a better performance for more moderate weather. 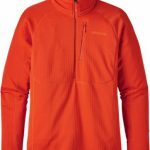 In this article we selected and reviewed the best hiking fleece jackets to make your buying decision a little easier. As fleece jackets provide very little protection against rain and wind, we recommend that you also read our review of the Best Hiking Rain Jackets or the Best Hiking Softshell Jackets. This selection includes primarily men's products. For women's products check out the Best Fleece Jackets for Women. 1. 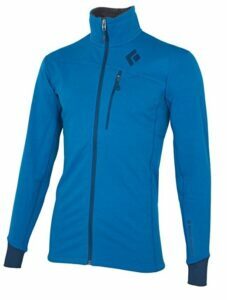 Buying a Hiking Fleece Jacket – What is important? Fleece jackets are made of polyester fleece (also called polar fleece) which is a soft and fuzzy fabric that comes in different textures and densities (normally from 100 g/m2 to 300 g/m2). Different textures and densities offer different levels of insulation – for example a jacket made of fleece with a density of 100 g/m2 will be significantly less warm than a jacket made of fleece with a density of 300 g/m2. When it comes to texture, the latest trend is achieving a grid pattern. Polyester fleece fabrics with a grid pattern are better at trapping the body-warmed air and thus provide a better warmth-to-weight ratio. 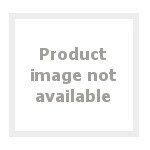 Polyester fleece fabric is typically very breathable and pleasant to the touch. Furthermore, as it absorbs very little moisture (less than 0.4% in its own weight), it also dries very fast and efficiently wicks moisture away from the skin. Some fleece fabrics include elastane fibers to increase stretch. A popular manufacturer of polyester fleece fabrics of different densities and textures is Polartec – its fleece fabrics are known for great thermal efficiency and thus highly popular in the outdoor clothing industry. More information about insulation materials can be found in our article Comparison of Mid-Layer Materials. Like all other hiking and mountaineering gear, a fleece jacket should be fairly light. Fleece jackets don’t have as good a warmth-to-weight ratio as down jackets or jackets with synthetic insulation but on the other hand they are also intended for different weather conditions (moderate to cold weather). However, they can be combined with a thicker insulated jacket in very cold weather for better moisture-management (perspiration) and insulation. 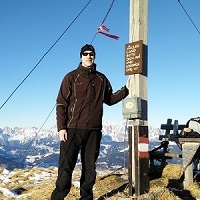 To learn why you should use lightweight gear for hiking, read our article Why hike lightweight. In this review we only listed lightweight fleece jackets which provide superb warmth. All fleece jackets in this review weigh less than 14 ounces (400 grams). It is a great benefit if a fleece jacket is equipped with pockets for storing hiking and mountaineering accessories – especially when you use it as the outer layer. The pockets should be conveniently placed in order to allow easy access even when wearing a climbing harness, backpack (hip belt) or other equipment. Weight 12.6 oz. 9.9 oz. 11.3 oz. 10.2 oz. 11.9 oz. The Mountain Hardwear Monkey Man Grid II is a very warm jacket which is highly appreciated among hikers and mountaineers. This hiking fleece jacket is made of Polartec High Loft fleece fabric which has a highly lofted structure in order to trap the body-warmed air more efficiently. The thermal efficiency of the fabric is further increased by its grid structure. 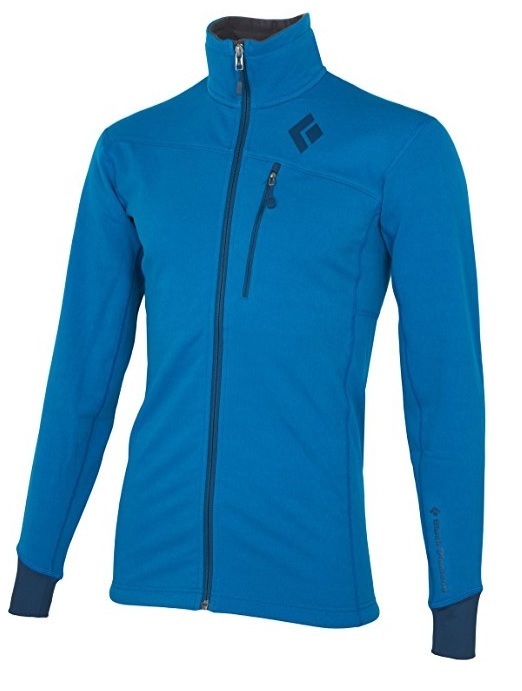 The Polartec High Loft fabric is also very breathable, moisture-wicking and quick-drying. The Mountain Hardwear Monkey Man Grid II also features stretchy and highly breathable side panels for freedom of movement and ventilation, an adjustable hem, two zippered hand pockets and thumb loops. The hand pockets are placed high in order to allow easy access when wearing a climbing harness or a backpack with a hip belt. The thumb loops prevent the sleeves from riding up during technical activities such as climbing. The Mountain Hardwear Monkey Man Grid II jacket is a great choice for every hiker, mountaineer or trekker. The jacket is also available as a hooded jacket which features a minimalistic hood made of thin and stretchy material for good fit. 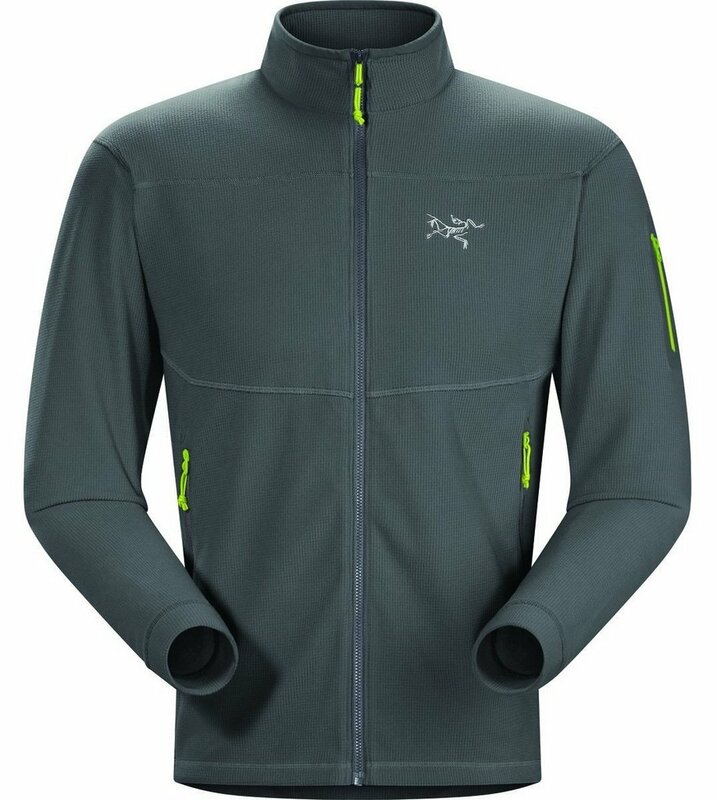 The Arcteryx Delta LT fleece jacket is extremely light (it weighs merely 280 grams) and thus best for those who want a high-quality insulation layer for very aerobic activities. 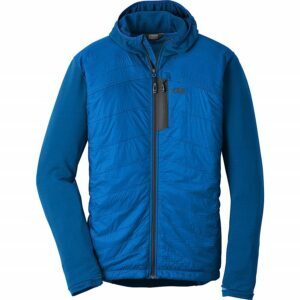 The jacket is made of Polartec Classic material (with the density of 152 g/m2) which is known for being comfortable, highly breathable, quick-drying and pill-resistant. In addition to that the Polartec Classic fabric also offers good warmth-to-weight ratio due to the lofted fiber structure which creates thermal air pockets in order to efficiently retain the body-warmed air. In addition to its superb material, the Arcteryx Delta LT jacket also offers great functionality. The jacket is equipped with a full length front zipper with a chin guard, drop back hem, two zippered side pockets and a sleeve pocket. The side pockets are well-placed and thus allow easy access even when wearing a climbing harness or a backpack. The sleeve pocket is equipped with a laminated zipper so that you can easily find it in the night. Due to the Polartec Classic material, the jacket also offers basic water and wind resistance. 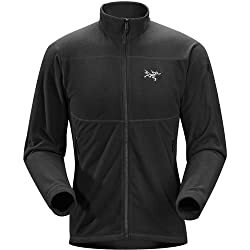 The Arcteryx Delta LT hiking fleece jacket is highly recommended for hikers, mountaineers, climbers and other outdoor enthusiasts who need a thin fleece jacket for highly aerobic activities. 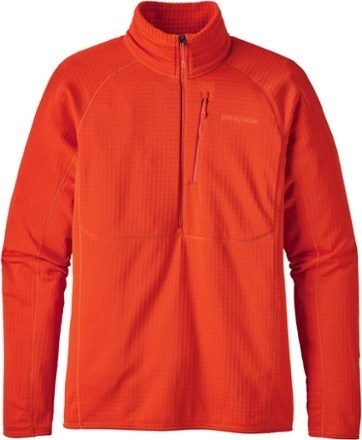 The Outdoor Research Deviator Hoody is another super light hiking fleece jacket. The jacket utilizes the advanced Polartec Alpha material as well as the more common Polartec Power Grid material. The Power Grid material is in the hood, sleeves and on the back while other areas are made of Polartec Alpha material. The Polartec Alpha was originally developed for the U.S. Special Forces and is very breathable, packable, quick-drying and warm for the weight. The Outdoor Research Deviator Hoody also features two hand pockets, one zippered chest pockets and a minimalistic balaclava-style hood. The hood is very thin and thus fits perfectly under a helmet. 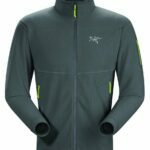 The Outdoor Research Deviator Hoody is perfect for outdoor enthusiasts who need a very breathable fleece jacket for their highly aerobic activities. The Black Diamond Coefficient hiking fleece jacket uses a fabric with higher density (180 g/m2) than the Arcteryx Delta LT jacket and is thus a little heavier, but on the other hand also provides better insulation. Therefore, it can be used as an outer layer even on relatively cold days. 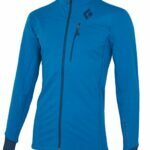 The Coefficient jacket is made of the Polartec Power Dry fabric which offers great moisture-wicking properties, dries fast and is highly breathable. The fabric uses a bi-component knit construction in order to efficiently transfer moisture to the outer surface and thus reduce the conductive heat loss. The Black Diamond Coefficient jacket is also equipped with a zippered chest pocket, stretch cuffs and thumb loops. The stretch cuffs offer great freedom of movement while the thumb loops prevent the sleeves from riding up. This fleece jacket is best for those who need a reliable and warmer mid/outer layer for their challenging hiking and mountaineering trips. The Patagonia R1 Fleece Pullover jacket is highly popular among hikers, trekkers and mountaineers as it has a great weight-to-warmth ratio. The jacket is made of Polartec Power Grid fleece material which utilizes Polygiene permanent odor-control. Therefore, the jacket stays fresh for longer which is very useful for multi-day hiking trips. The fabric has a grid structure which enhances the thermal efficiency as well as increases the breathability and moisture-wicking performance. The Polartec Power Grid fabric is also very stretchy and durable. 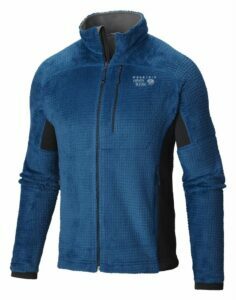 Besides the outstanding material, this hiking fleece jacket also features raglan sleeves for freedom of movement and a zippered chest pocket. The half-length front zipper comes in handy when increased ventilation is required. 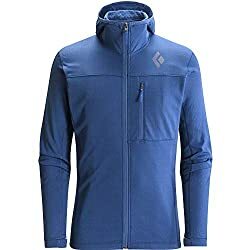 The Patagonia R1 Fleece Pullover is a great choice for hiking in moderate and cold weather – it’s also not too thick to be worn under a rain jacket or an insulated jacket (in very cold weather). What is a fleece jacket made of? Fleece jackets are made of polyester. The polyester thread is woven into a fabric and then brushed to achieve greater volume in the fibers. Fleece can also be made of recycled plastic bottles or recycled old fleece material. Many companies are becoming increasingly eco-friendly and utilize this method. Are fleece jackets good for winter? Fleece jackets are best for moderate temperatures. They provide good warmth but not as good as down jackets or jackets with synthetic insulation. In very cold weather you will simply be better off with a down jackets or a synthetic jacket. Fleece is typically warmer than wool but not as warm as down or synthetic fill (same thickness of material). Is fleece warmer than wool? Yes, a 12-ounce fleece jacket will be in most cases warmer than a 12-ounce wool jacket. However, note that fleece fabrics can differ wildly in quality and warmth.